Benson's girls basketball team left Chiles Center on Saturday with silver medals around their necks and another chip on their shoulders for next season. After a 46-27 loss to top-ranked Southridge in the Class 6A championship game, it was tempting for Benson to look ahead. Four of five starters are slated to return, including the talented trio that under the guidance of coach Eric Knox has lifted Benson girls basketball to relevance. But first it's important to reflect on a historic season. The Techsters finished 23-6, with two losses to the Southridge powerhouse. A Benson team reached the quarterfinals — and the state tournament proper — for the first time since 1996. The Techsters, seeded No. 7, upset second-ranked Tigard in the quarterfinals and stunned No. 3 Beaverton with Tayler Lyday's end-to-end buzzer beater for a one-point semifinal win. That game — that play — was emblematic of the distance the Techsters have traveled. Sure, their skill continues to improve. But it was belief, confidence and composure that stood out. Knox, as he often does, talked of the bigger picture after the championship loss. He talked about how reaching the title game can resonate within the Benson community. "I want kids that are under-resourced to realize they can get it done in their own schools," Knox said. "It's good for us to create a blueprint for the girls here in the city so they see that if I put in the work, I can develop here in my own backyard and possibly play in the state championship game." Knox was particularly happy that 5-3 point guard Makenzy Porter was voted by tournament coaches to the all-tourney first team. "She's the most under-appreciated guard in the state. It was great to see her get her just due," Knox said. "There is no Benson girls basketball without Makenzy Porter. If you're going to tell our story, you must start with her." Porter was glad coaches appreciated her play even though her name was not among the tournament stat leaders. "It's not only me. My team helped me a lot," Porter said. "It's not what I do in the scorebook. You have to be at my games to see what I contribute because I'm not always in the stat book." Porter said people surprised by Benson's run to the title game weren't paying attention. The Techsters have size and athletic ability — and more. "We have way more fundamentals and way more discipline than everybody thinks we do," Porter said. Lyday, a unanimous first-team all-tournament choice, was all over the stat sheet. 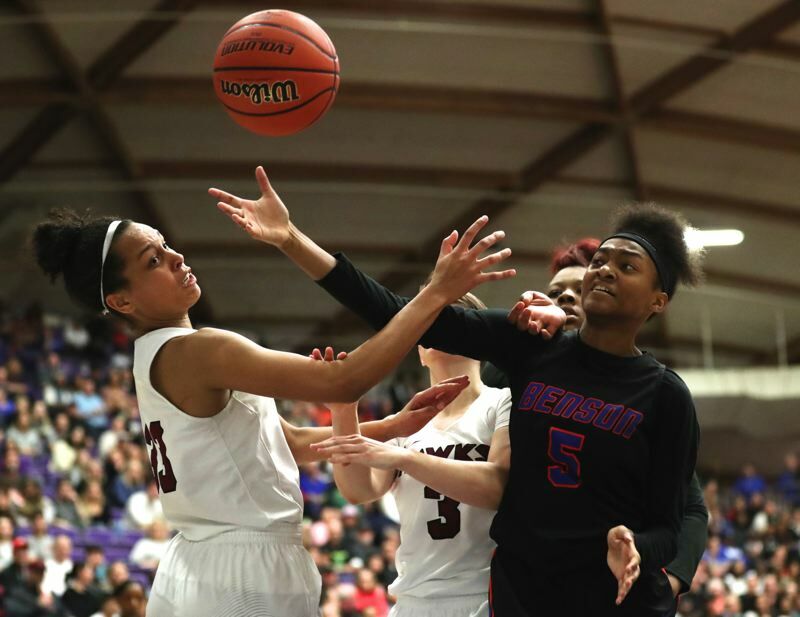 Her 34-point game and winning shot against Beaverton highlighted a tournament in which the 6-1 junior finished first in scoring (19.7 points per game) and free throws made. She also was among the leaders in offensive rebounds and blocks. Knox said he will remember this team for "showing our true heart, and the life lessons these girls will take with them for the rest of their life." Those lessons included resiliency — which the Techsters showed by battling from behind multiple times and by playing through discomfort as Ciera Ellington did with her injured hamstring. Porter credited a talented Southridge team for earning its state title. I feel like next year we're going to use this as fuel," she said. "We want to win a state championship. It's a high schooler's dream. I'm satisfied, but I haven't reached my dream yet." • Top-ranked Marist Catholic held off La Salle Prep's effort to repeat as 5A girls basketball champions, taking the title game 59-44 on Friday at Gill Coliseum in Corvallis. La Salle Prep finished 23-5. The championship game was their only loss to an Oregon 5A foe. Trailing much of the game, the No. 2-seeded Falcons pulled within three at 44-41 in the middle of the fourth quarter, but a 3-pointer for the tie didn't fall, and Marist pulled away. La Salle senior Taycee Wedin was a unanimous selection to the all-tournament first team. She was third in the tourney in scoring, averaging 14.7 for the three games. She led the tournament in made field goals and 3-pointers. Falcons sophomore Emily Niebergall also was among the five players on the all-tournament first team.